Four—they have an all-day breakfast—at least I’m assuming that’s what ‘til late’ means. The Saturday we were there was no exception to the ‘packed to the rafters’ status even though it was less than 10 degrees celsius and absolutely bucketing down rain, the place was literally chockers both inside and out. The standard weekday breakfast menu is not extensive but offers enough variation on each individual dish to give you more options to choose from, and includes sweet choices granola and pancakes, as well the usual savoury favourites. The weekend menu has much more on offer and the prices are very reasonable compared to what you might pay in the city. The main menu provides a choice of snacks and share dishes, salads, burgers, classics such as steak, and fish ‘n’ chips, and desserts—though sadly not GF, and there’s a good wine list. We ordered Eggs Benny with bacon, a freshly made juice, and pot of tea. 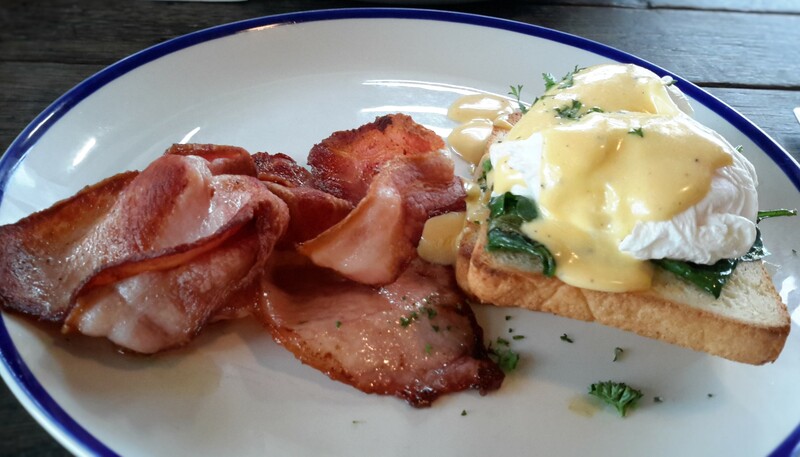 The service was fast and friendly, and the Eggs Benny was brilliant and generous with the eggs done to perfection, nice wilted spinach, and plenty of bacon, plus two pieces of toast. The only downside, and this applies to most cafés I’ve visited, is the tea. Why do they think it’s OK to charge around $4.50 for a pot of hot water with a teabag? Seriously, is it so hard to provide real tea? I’d willingly pay a bit more to see an infuser in my teapot. Edgar’s also caters for the sporting fans among us with footy nights (all codes). For those not into sports, get down there on Sunday afternoon for some great acoustic music by local groups and bands. Bookings are essential on the footy nights, and probably a good idea anytime on the weekend. Edgar’s Inn, Ebden Street, Ainslie. Open Mon-Fri 7am – ’til late, weekends from 8am – ’til late. 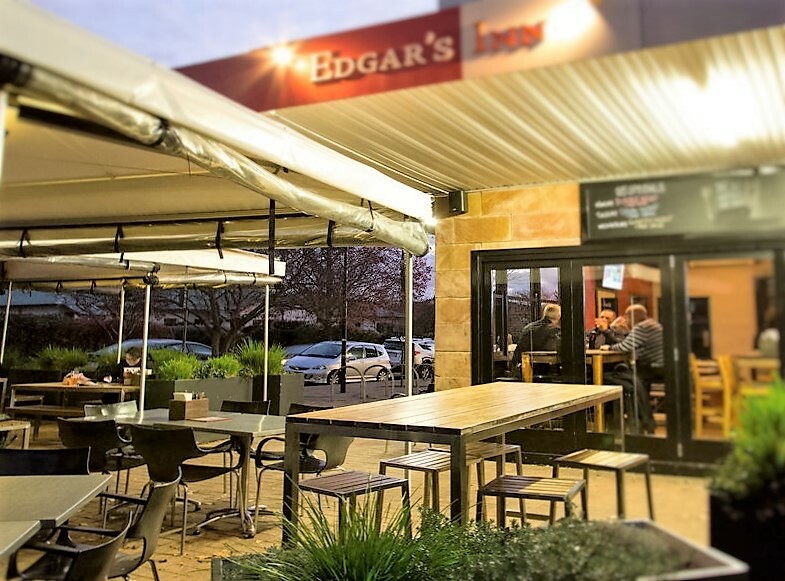 This entry was posted in LFW Your Canberra and tagged Best Canberra breakfasts, Edgar's Inn Ainslie, Eggs Benedict on June 8, 2016 by gracienumber1.